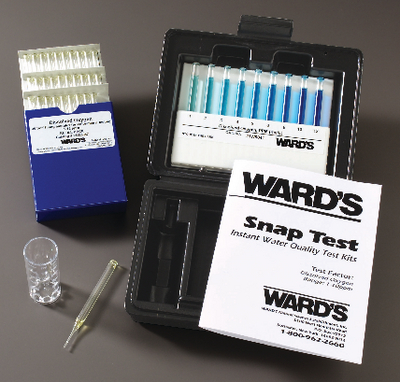 You never need to touch a chemical with Snap Test Instant Water Quality Test Kits. 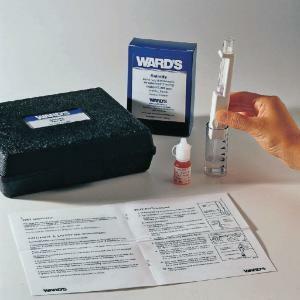 Stir the reagent-filled ampoule in a small water sample, and snap off the tip by pressing lightly to the bottom of the sample vial, so water flows into the ampoule but can’t flow out. After a single minute, check the ampoule’s color against permanently sealed comparators that look just like the test ampoules. In Titret tests, the amount of liquid that must be drawn into the ampoule to cause a color change determines the concentration of a test factor. The level is measured against a scale, in ppm, on the ampoule itself. Ward’s Snap Test Kits test for water quality factors in both fresh and salt water, except for nitrate tests, which can test only freshwater.